Add Indian craftsmanship in your home by hanging this area rug on the wall. This is a wall hanging area rug and woven in Handspun wool, bamboo silk and cotton material. It has taken about 7-8 months to weave this unique and beautiful rug. Perfect representation of a beautiful forest. The design has been inspired by the Ideal Jungle where all animal lives together with love. The ground of this carpet is filled with animal motifs, trees, and flower bunches. The main colors are cream, red, yellow and blue. It made in handspun wool, bamboo silk and cotton material. It is woven on a handloom by our expert craftsmanship in India. 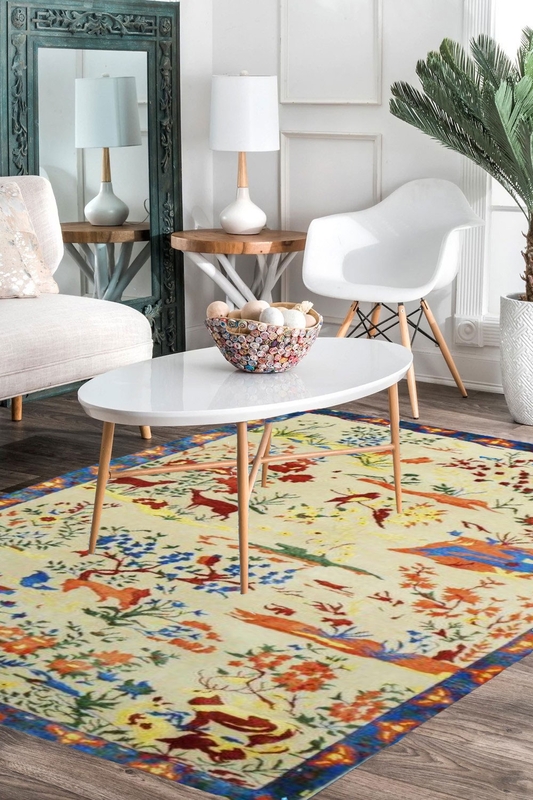 This area rug is perfect for the wall hanging so create a focal point in your living room by adding this "One of a kind" modern wall hanging carpet. The border of this rug is in blue color.